"This combination of factors, all these things coming together in a single year, was basically the 'perfect storm,' for Antarctic sea ice," said corresponding author Malte Stuecker, a UW postdoctoral researcher in atmospheric sciences. "While we expect a slow decline in the future from global warming, we don't expect such a rapid decline in a single year to happen very often." The previous year, 2015-16, had a very strong El Niño in the tropical Pacific Ocean. Nicknamed the "Godzilla El Nino," the event was similar to other monster El Niños in 1982-83 and 1997-98. Unlike the 1997-98 event, however, it was only followed by a relatively weak La Niña in 2016. Far away from the tropics, the tropical El Niño pattern creates a series of high- and low-pressure zones that cause unusually warm ocean temperatures in Antarctica's eastern Ross, Amundsen and Bellingshausen seas. But in 2016, when no strong La Niña materialized, researchers found that these unusually warm surface pools lingered longer than usual and affected freeze-up of seawater the following season. "I've spent many years working on tropical climate and El Niño, and it amazes me to see its far-reaching impacts," Stuecker said. "This was a really rare combination of events, something that we have never seen before in the observations," Stuecker said. Scientists predict Antarctica's ocean will be one of the last places on Earth to experience global warming. Eventually the Southern Ocean's surface will begin to warm, however, and then sea ice there will begin its more long-term decline. 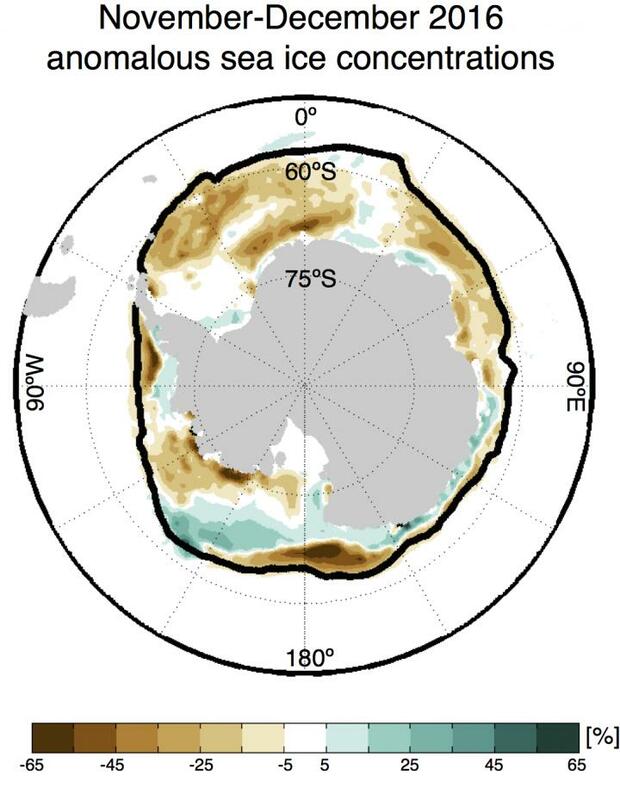 "Our best estimate of the Antarctic sea ice turnaround point is sometime in the next decade, but with high uncertainty because the climate signal is small compared to the large variations that can occur from one year to the next," said co-author Cecilia Bitz, a UW professor of atmospheric sciences. "For understanding the climate system we must combine the atmosphere, ocean and ice, but we must focus on more than a specific region," Stuecker said. "If we want to understand sea ice in Antarctica, we cannot just zoom in locally — we really have to take a global perspective." The other co-author is Kyle Armour, a UW assistant professor of atmospheric sciences and oceanography. The research was funded by the National Science Foundation and a National Oceanographic and Atmospheric Administration's Climate and Global Change Postdoctoral Fellowship Program, administered by the University Corporation for Atmospheric Research's Cooperative Programs for the Advancement of Earth System Science. For more information, contact Stuecker at [email protected] or Bitz at [email protected] and reach either author at 206-543-1339.